I remember when we were building our house, the day the carpet went in. I was so excited to have carpet again as the place I had been living in was wall to wall wood floor, which gets old. That night we went into the empty house, laid on the carpet, and watched Rebecca turn cartwheels, literally. I was so excited to have a house, with soft carpet and the hubby and I talked about where we would put our first Christmas tree. A random memory but one that stuck with me. Fast forward to this past Friday night, laying on that same living room floor that was now layered with blankets. Cora had the flu and our make shift floor bed seemed to be the best idea to handle all the puke. She laid in between us, restlessly sleeping, so out of it, my husband snoring, the dog at our feet. I was in and out of sleep waiting for the next round, staring at the lights on the Christmas tree, exactly where we said we would put it 4 1/2 years ago. The house and world seemed perfectly dark and calm. So much has happened, so much life in this house already. Raising kids, I have had so many older people look at me, with nostalgia in their eyes, and say You are living the best days of your life. Often my sleep deprived, busy, crazed self wonders how but for some reason, the other night, smelling of puke, I agreed. These are the days we miss a family Christmas and watch movies on the couch with a toddler who normally never slows down. These are the days that we pile next to the Christmas tree to sleep as a family. These are the days that we determine who bathes the puke covered toddler and who scrubs down the puke covered crib while we laugh so we don’t cry. All made even better when you finally sneak out as a couple, at the end of the long weekend, and catch those reservations for a nice dinner. You sit down, take that first sip of wine, order a nice steak and your husband dashes to the bathroom because one of us had to be next for the flu. It was all of these moments that forced me to pause a little bit and suddenly, I finally found a little bit of the holiday cheer I felt I had been missing this year. Can you imagine that is what it took? These are all the moments that we will look back on and laugh. The moments where you feel like you won’t make it to the end. The moments that keep you on the end of your rope. But all these moments bring us closer together and continue our story as a family, as crazy as it may be. I hope you are all finding your little moments and your holiday cheer, even if during the strangest times. Beautiful!! Cora is lucky to have such awesome parents! 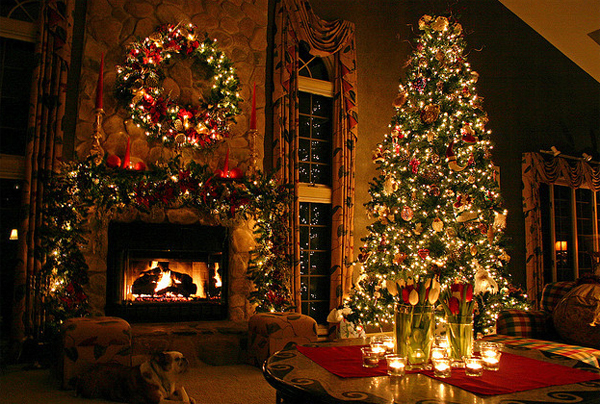 And don’t we all wish that our christmas set up could look as amazing as that picture you posted!